The Soloist is a 2-part glove (removable Primaloft “BDry” waterproof liner and nylon shell) mountaineering and skiing glove designed for harsh alpine environments where warmth and dexterity are crucial. 194 gr per pair for size M.
In my never-ending search for the holy grail of alpine gloves (warm, tough, dexterous, waterproof…impossible) I decided I’d had enough of cold hands and I had to sacrifice a little dexterity for some increased warmth. 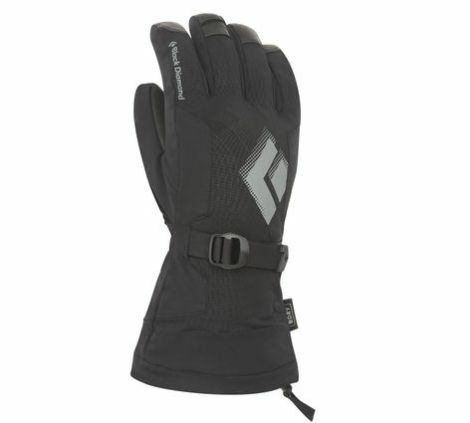 At €100 the Black Diamond Soloist Glove is firmly in the “it better work well and last” category for me – fortunately, it has. In the Alps, in winter, gloves have to work. 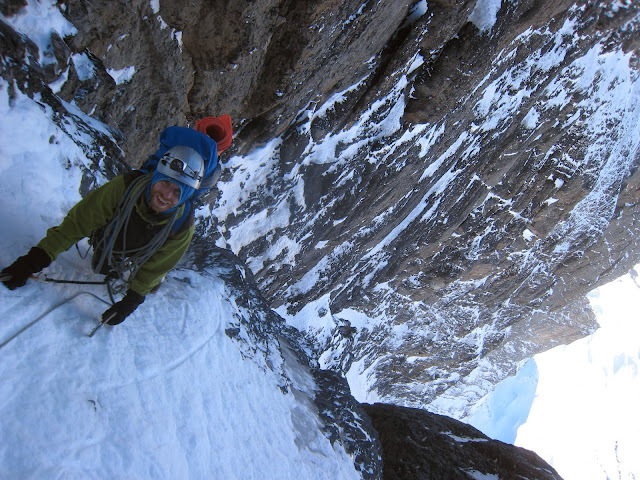 I have spent far too long hanging around – on lead and seconding – waving my arms and shaking my hands to rewarm them. This is all time wasted, time I should be moving onwards and upwards. Since picking up these gloves I have used them in temperatures as low as -15c on single and multi-day alpine ice and mixed routes (such as the Supercouloir du Tacul, Gabarrou/Albinoni, Vent du Dragon etc. and skiing too and from these routes. The gloves are roomy but have a webbing strap across the back of the wrist to cinch down the glove. Finger lengths are fairly average so should fit most people well. I would say that I have slightly colder than average hands. So far, I have only suffered from cold fingers on a handful of occasions on the coldest of days. On a recent climb of the 1938 route on the Eiger (temps from -5c to -15c) I had warm dry hands for all but the final hundred or so metres on the first day. Being able to remove the liners and stuff them inside my clothes overnight meant I could dry them out fully. On the second day, I got cold hands once or twice but never cold enough to get the hot aches. This is near miraculous for me! I have climbed a number of harder pitches with the gloves and, while being less dexterous than many thinner gloves, I have had no fumbled gear, ice screws etc. and the gloves are surprisingly easy to take off and put back on if you need a few moments of added dexterity for checking topos or taking photos. I would expect that they will be good for people who suffer from cold hands but may be a touch too warm and bulky for typical Scottish winter mixed climbing. So far, I have climbed 4500 metres of alpine routes of TD and above and I have only needed to glue (seamgrip) two small pieces of the shell at the fingertips. The palms are standing up to all the abseiling quite well and the gloves have remained as waterproof as when they were new. The plastic end-cap for the elastic wrist cuff adjuster has fallen off one glove – not a major issue but a bit annoying all the same.